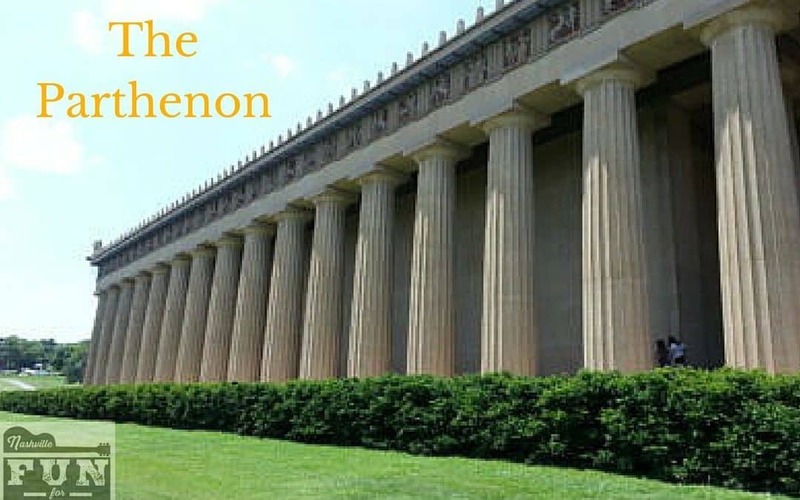 Located in Centennial Park, The Parthenon is one of Nashville’s most famous landmarks. It is a full scale model of the original Parthenon in Athens, Greece. It was built in 1897 as the centerpiece for the Tennessee Centennial Exposition. 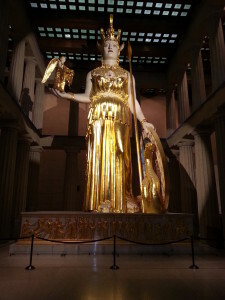 It is the only building created for the Exposition that was preserved by the city after the event.The Parthenon was not built to be a permanent structure but the people of Nashville loved it so much that it was preserved and rebuilt to stand the test of time. No good tour of Nashville is complete without a stop at The Parthenon. Depending on the age of your little tourists, you may or may not want to take advantage of the full tour. As you drive into Centennial park, you will find ample signage to direct you to the appropriate parking lot. Once you park, it is a short walk to the entrance. Once inside, there are bathrooms on your left, a gift shop on your right and the ticket counter is straight ahead. After you purchase admission, you will enter the gallery level. The Parthenon serves as Nashville’s art museum and exhibits in the main chamber change from time to time. There is artwork and memorabilia lining each side of the gallery from the building and early days of The Parthenon. If you have older children or kids that love art, this will be a nice tour. If you have toddlers or uninterested teen-agers, you will probably walk through very quickly on your way to the second floor. The second floor can be accessed via stairs or elevator. This is where all the action is 🙂 The main attraction here is the statue of Athena. I think everyone should tour the Parthenon at least once to see this statue. Pictures cannot do this justice. Your kids will be awestruck…for about three minutes. There is seating on both sides of the gallery on the second floor if you need a rest. Surrounding the Athena statue on either side are smaller reproduction statues patterned after the original Parthenon marbles. Word of Caution! These statues are anatomically correct. Your kids may be shocked, embarrassed or amused. Behind the Athena statue is a smaller room with more plaster reproductions. The big draw for kids in this room is the huge door. Let them try to open or close it. It’s one of the only things inside the Parthenon that is ok to touch. Touring the entire inside of the Parthenon will take less than 30 minutes. (It could take much longer if you read all the notes about the artifacts and art pieces.) You can spend as much time as you like during open business hours but, if you have younger kids, you are probably going to want to spend more time outside than in. The outside area at the Parthenon can be lots of fun. My kids love to run around the entire perimeter of the building and count the pillars. There are large open greenspaces surrounding the Parthenon in Centennial Park. This is a great place to have a picnic after your visit. There are stunning views of the Parthenon from all four sides. And, honestly, seeing the architecture is really the best part. So if you have little ones who are not yet able to be quiet and still enough to tour the statue and art gallery, don’t despair. The view of the Parthenon from the playground at Centennial Park is beautiful and FREE!